This silky smooth and perfectly pipeable Pink Champagne Buttercream Frosting is sure to make any occasion feel more special! Consider it for anniversaries, weddings, showers, 21st birthdays, New Years, and more. We have two Pink Champagne Cake recipes in our recipes section. One is our Pink Champagne Cake from Scratch, and the other is our Pink Champagne Cake (doctored cake mix) recipe. So whether you enjoy baking cakes from scratch, or working with doctored cake mixes, we have an amazing Pink Champagne Cake recipe for you to try! We’ve received so much positive feedback from this recipe since we first posted it. Pink Champagne Cake is just one of those perfect special occasion go-to recipes that brings a bit of a “wow factor” from the name alone, and the taste is out of this world. 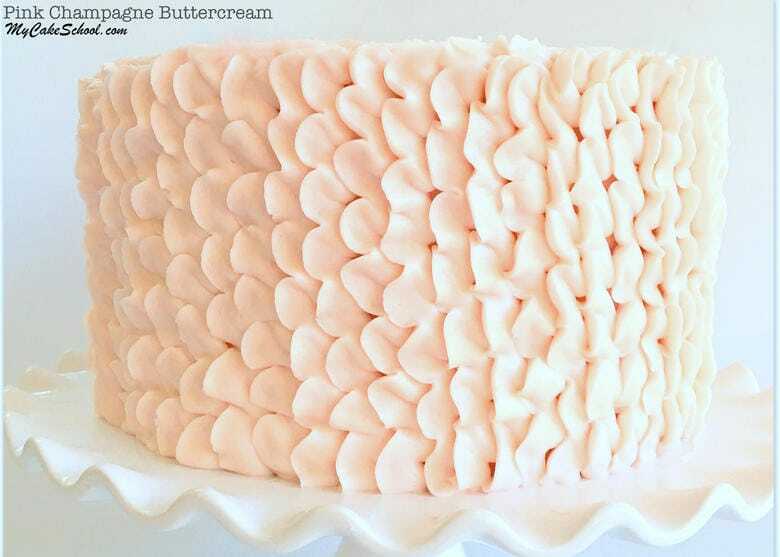 Our Pink Champagne Buttercream Frosting is a crusting recipe, but if you prefer a lighter crust, see the adjustments to the recipe at the bottom of the post. The recipe makes approximately 8 cups of frosting to allow for a delicious filling and decorative piping. However, you can easily cut this recipe in half if you don’t require this much frosting! We hope that you enjoy this recipe as much as we have! 12 cups (1380g) powdered sugar (depending on the desired consistency, more sugar = more crusting) If you prefer a frosting that crust less, see the note at the bottom of the recipe. Gradually add the powdered sugar with the champagne until the powdered sugar is incorporated. Beat at medium speed 3 to 4 minutes. The texture will become very smooth. If you are tinting the entire batch of buttercream light pink, you can add a very small amount of coloring gel while it is mixing. This recipe makes approximately 8 cups of frosting. *For a softer buttercream with a much lighter crust, cut the amount of powdered sugar from 12 to 9 or 10 cups and cut the amount of champagne form 1/2 cup to 1/4 cup + 1 Tablespoon. Also, cut the salt to 1/2 teaspoon. This lighter consistency works well for cupcakes or cakes that don't require the Viva method of smoothing. **Check out our Pink Champagne Cake recipes! Thanks for stopping by! Don’t forget to visit our full listing of FAVORITE cake and frosting recipes in our Recipes Section! We also have tons of easy cake tutorials in our Free Tutorials Section! (And of course, members have access to all of the videos in our Videos section as well.) There’s something for everyone! We hope you’ll stop by again soon. If you’re interested in becoming a full member of My Cake School, hop by our Join section for more details. I made this recipe today and Oh my Stars!!! It is spectacular!! And, soooo pretty!! Cannot wait to put the cake all together! Thank you Melissa & BeBe, as always!! After reading this article, I could not stop to myself from making it. So i prepared it. It was too yummy!!!! This champagne cake is one of my most requested cakes from friends and family! In fact, I have 3 layers in the oven right now. I was wondering what tip you used in both of those pictures. They are both equally beautiful! I have been doing a simple basket weave, as my loops always seem lopsided. Thank you so much for sharing this recipe! Hi Mary, I used a tip 21 for the scratch cake, and a tip 104 for the doctored cake mix version. You can see a longer description in my comment just above yours. Thanks! I made this cake for my daughters 19th turned out great ! Hi! This icing is delicious! I made it the night before & refrigerated. When I went to frost it the next day, it looked like it had “broken.” Any idea what might have gone wrong? Should I have rewhipped it before using? Also, do I need to reduce liquid in order to pipe rosettes on the side of the cake? Thank you! HiJoycelyn, Yes, I think you needed to rewhip the buttercream. Bring the buttercream back to room temperature and remix. Some buttercreams can be remixed with a spoon and will be fine, other times you may need to rewhip with a hand mixer or your stand mixer. Depending on the climate you live in you may need to adjust the amount of liquid for your buttercream. We don’t adjust the amount for piping rosettes, Melissa typically frost the cake and pipes rosettes with the same consistency frosting, but experiment and see what works best for you. If you find it too soft, just add a bit more powdered sugar. When piping rosettes make sure the rosettes attaches to the cake and not just to the rosette above (or below) it, otherwise it could slide down and off the cake. My daughter age 11 made this for my birthday it was amazing. She did the whole thing herself. It tastes spectacular!!! Hi Natalie, Such a sweet daughter to do this for you. Congratulations, to her on this beautiful cake!! I am impressed!